Industry commentary surrounding catastrophe bond rates has suggested lately that market prices have reached a floor, but research from RMS reveals that returns in the asset class relative to risk values are actually higher this year than those seen in 2014. One of the world’s leading catastrophe risk modelling firms, RMS, has said that investors in the cat bond market have experienced higher returns throughout 2015 than last year. Recalculating expected losses within the market portfolio to take into account time-value money and seasonal variations, reveals that spreads have actually been higher this year, explains RMS. 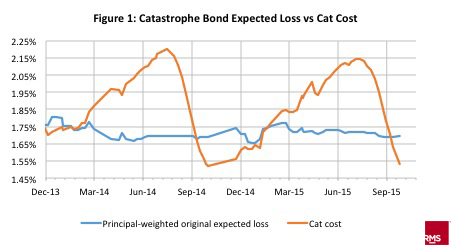 “Primary pricing of individual cat bonds is based largely on the expected losses available from ILS portfolio management platforms, but true risk pricing can be calculated only by considering all dimensions of loss, including seasonal variations and the time-value of money. “Only by having all bonds evaluated in one risk platform can changes in risk premium over time be better evaluated to identify new trends in the market,” said Jin Shah, director, capital markets, at RMS. The news from RMS could point to greater cat bond price sustainability at the current low levels for a longer period, at least for certain layers of risk, at a time when prevailing market noise suggests that pricing in the sector may have bottomed out. RMS explains that to gain an insight into the true pricing environment of the cat bond market, it applied the same model to over 130 issuances in the secondary trading markets. The methodology revealed, for example, “that on Sept. 30, 2014, the difference between bond spreads and the adjusted expected loss was 2.22 percent, compared with 2.52 percent on the same day this year,” says RMS. RMS continues to explain that as the hurricane season approaches cat bond spreads rise each year, and then fall as the season wanes. As a result RMS notes that it split certain analysis between issuances covering U.S. hurricane risks and those that cover U.S. earthquakes, to better account for seasonal pricing impacts. Catastrophe bond issuance levels during 2015 has remained strong, following on from the record-levels witnessed during 2014, which was helped by the $1.5 billion Everglades Re Ltd. (Series 2014-1) deal. And while some industry commentary has discussed the continued decline in rates and the possibility of pricing reaching a floor, the news from RMS reveals that investors and market participants are achieving better returns than in 2014, which will be welcomed news to those considering to enter the market and utilise the benefits of the insurance-linked securities (ILS) market. “Despite the prevailing commentary, the catastrophe bond market is returning markedly more to investors today than it did a year ago, when it bottomed out. But only accurate risk and return modelling reveals the true rewards,” said RMS.